This issue is out now. 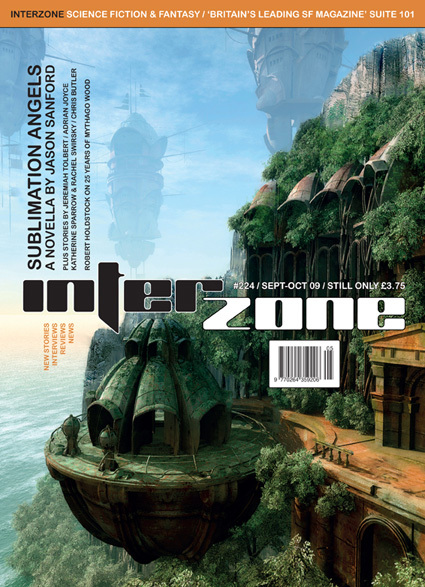 More details, extracts and contributor links in the Interzone section of this website (Current Issue). We hope you enjoy this issue and look forward to reading your comments on this thread. Subscribing to Interzone is a Good Thing! Last edited by Andy on Thu Nov 12, 2009 10:49 am, edited 1 time in total. Just landed in not so sunny Norfolk, and smells wonderful, as ever. Black Static, the new fragrance from Giorgio Armani. Arrived in Doncaster area today. I'm afraid there was a typo in the back cover ad for Steve & Deja Whitehouse's novel Einstein’s Question. So I've corrected it here and also saved you the hassle of Googling the right site. and George Berger has posted his review of Einstein’s Question here in the forum. No Longer You was also a pretty good story. Arrived in Bethesda early in the week. Should have posted up then, but this week has been so busy. How busy? I haven't even had time to open the damn thing yet. Also recieved complementary Black Static. I'm a very happy shopper! Another enjoyable issue, with a good range of genres covered. I liked 'Sublimation Angels', though I wasn't entirely satisfied with every aspect of the denoument. I think I would have liked a few more answers at the end (greedy, I guess), and I wasn't entirely sure why the two AI's were at war with each other in the first place. Still, I loved the setting - who knows, maybe there will be a sequel somewhere down the road? 'The Godfall's Chemsong' deserves a special mention for it's evocative bringing to life of an alien species, but I think 'No Longer You' won out as my favourite story of the issue. Interestingly I felt both this and 'Shucked' (which was a great little horror story) would have felt equally at home in Black Static, but as Interzone is supposed to cover fantasy as well as science fiction there's obviously going to be some overlap. Maybe Black Static can give us some zombie spaceships next issue? I always find reading the longer stories in Interzone a bit overwhelming (I guess when I read Interzone I'm after quick hits!) but I really enjoyed Sublimation Angels by Jason Sanford - I couldn't turn the pages quickly enough. Very good. 'No Longer You' by Katherine Sparrow & Rachel Swirsky was a great idea beautifully written. Lovely. 'Shucked' by Adrian Joyce. A really promising start for a new writer. I totally got this - the next step in spam - genius! 'The Godfall's Chemsong' by Jeremiah Tolbert did an amazing job of placing me in a completely different state of existence. And I wanted to know what happened next. Wonderful. 'The Festival of Tethselem' by Chris Butler. My favourite story of the issue. I didn't see the ending coming (despite my best efforts!) and it all came together perfectly. Would love to read more stories in this setting. A big shout out to the various artists / illustrators too - all the artwork complemented the stories perfectly, and added to the 'high quality' feel of the magazine. Keep up the good work Andy ! Thanks for all reactions so far. Here's the first 'official' review I've seen, from John DeNardo of SF Signal. It's a blinder. Agree on the Chris Butler being my favourite of the issue: neat worldbuilding, and I loved the way things came together at the end. I also liked "The Godfall's chemsong" for the nice portrayal of an alien species in a remarkably short space. Just back of holiday and reading 224. I would say this is one of the best Interzones I have ever read. Sublimation Angels was a great story which got me hooked straight away. The Festival of Tethselem is another great story with some great ideas. The Godfall's Chemsong and No Longer You would not normally be my thing, but I enjoyed both of them. Shucked was ok but not as the other stories.